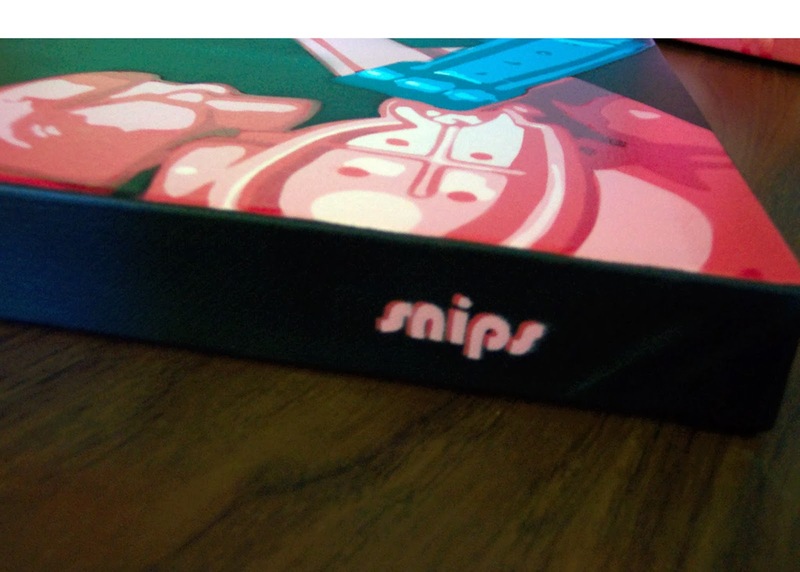 In this case, the name snips. but around here i think it's time to start using my "real" name. 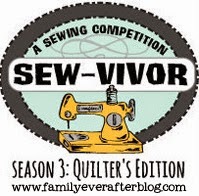 The name snips came about long before i was quilting and blogging. I no longer remember when i started using it, but it's roots go back to my life as an artist. 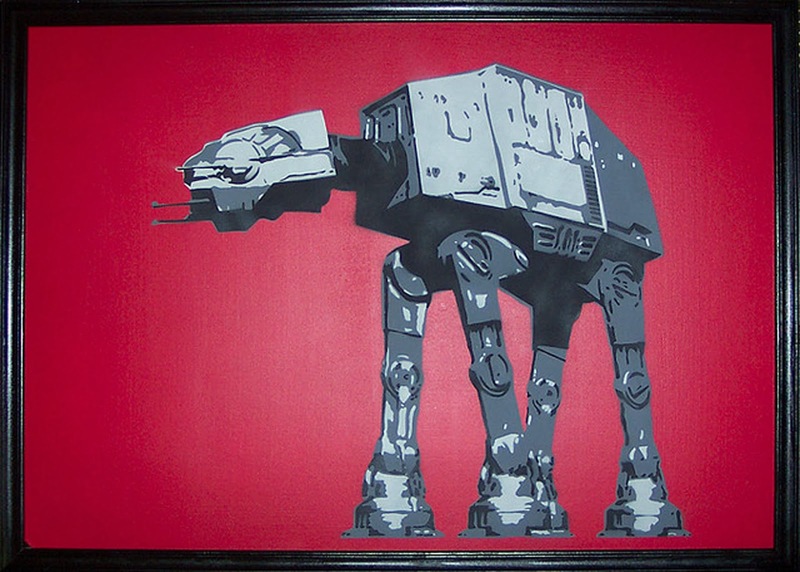 That's right, i bet you didn't even know that i was once a spray paint artist! I assure you that i've never painted anything illegally, but the artist name is just part of the package! That being said, i'm not here to start a debate on the rights and wrongs of street painting. Nor am i here to talk about that. I'm really just here to let you know that from this point on, my posts will be signed off by me, Nicole. I'm the one on the right! I don't paint anymore, though someday i hope to return to it. 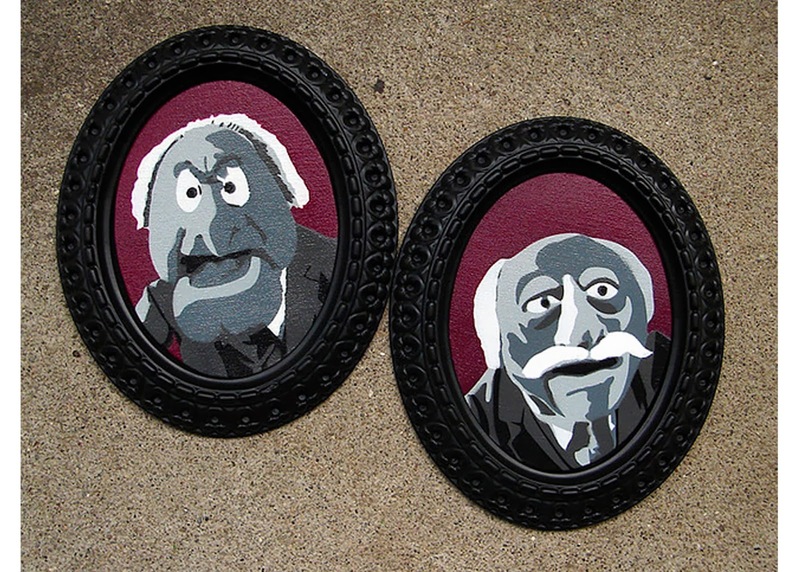 Spray painting isn't something that's safe or easily done with two little boys underfoot! 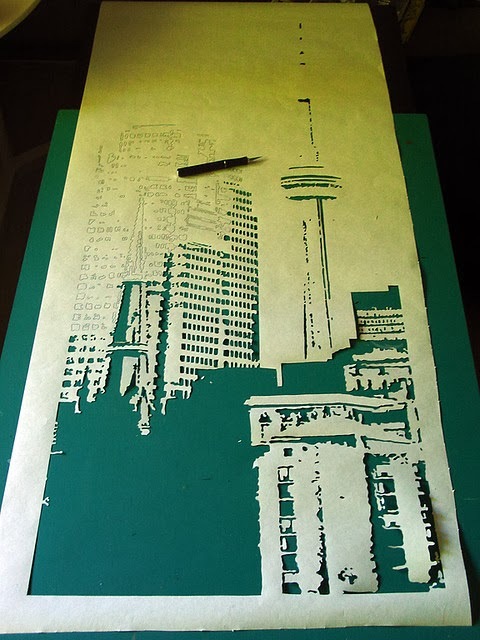 Nor is hand cutting all the stencils. 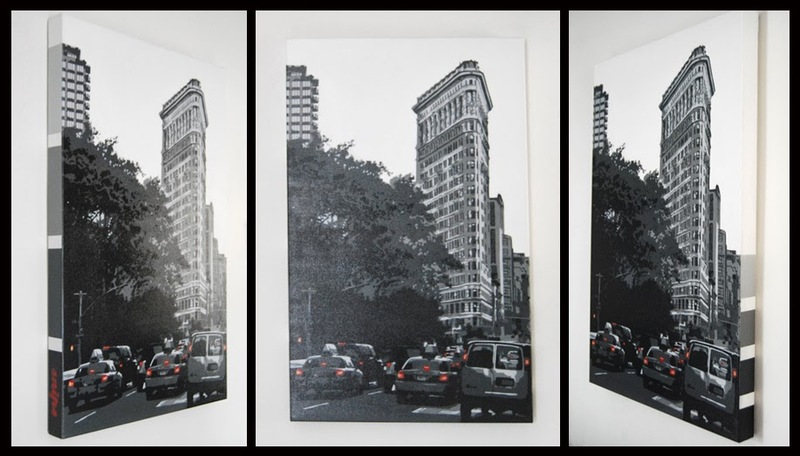 Multitudes of paper stencils that little hands could easily crumple and rip! This hasn't been a decision that i've made lightly. I've been thinking about it for some time now. Then all it took was one simple question, that Anne of Play Crafts asked me. 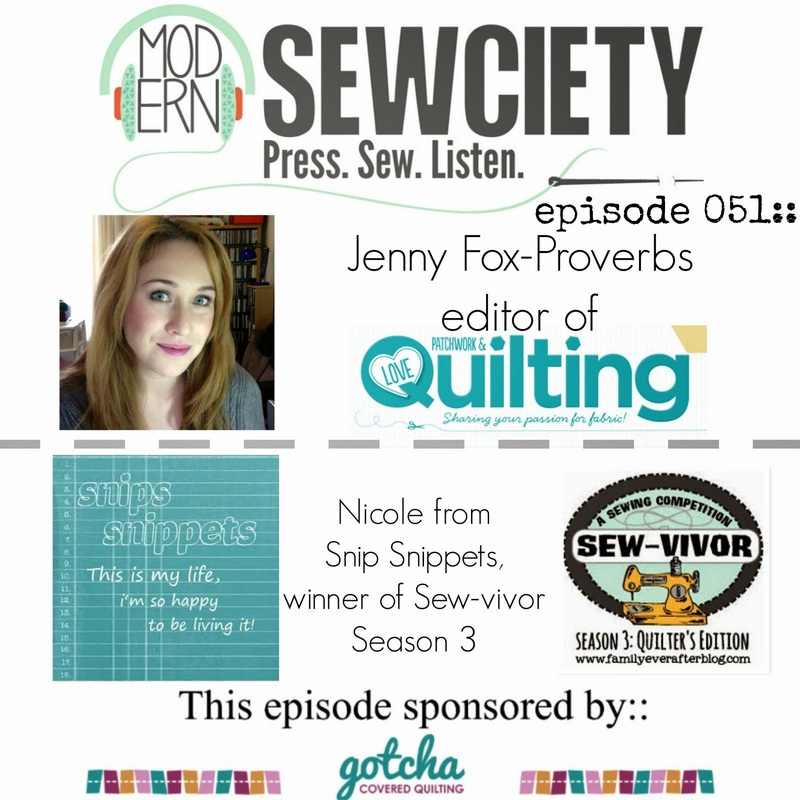 ~ If you ran into someone at a quilting convention, would you want them to call you nicole or snips? And there was my answer. As easy as that! Though i've also spent quite some time deliberating on whether or not i could stop using the name and still call my blog snips snippets. Yes, yes i can. It's my blog and i can call it what i want! I will always be snips, it's just time to... i don't want to say grow up, but maybe move on. So i guess that's really all i need to say, i hope you've enjoyed this look into my past! Sorry for the lack of quilty pics today, but rest assured i will be back with the progress on Sammy's bday quilt soon! Any problems with that and you can take it up with the peanut gallery! High fives for snips, it's been fun! This week i tackled #7 on my FAL list, the set of ROYGBIV nesting bowls i had been wanting to make with the left over canvas i had from my boys curtains. Though i guess i should really call them ROYGBV bowls. I went straight from blue to violet, sorry indigo you didn't make the cut! I love the contrast of the black and white exterior and the rainbow interior. I opted to use the canvas for the lining as well and just add a band of the pearl bracelets for the pop of colour. The double layer of canvas gives the bowls some structure as i chose not to use interfacing. That being said i think the two largest size bowls could use a bit more stability. They stand fine on their own but they are a tad slumpy. But when stuffed with toys they're perfect! And look how awesome they look all stacked together! 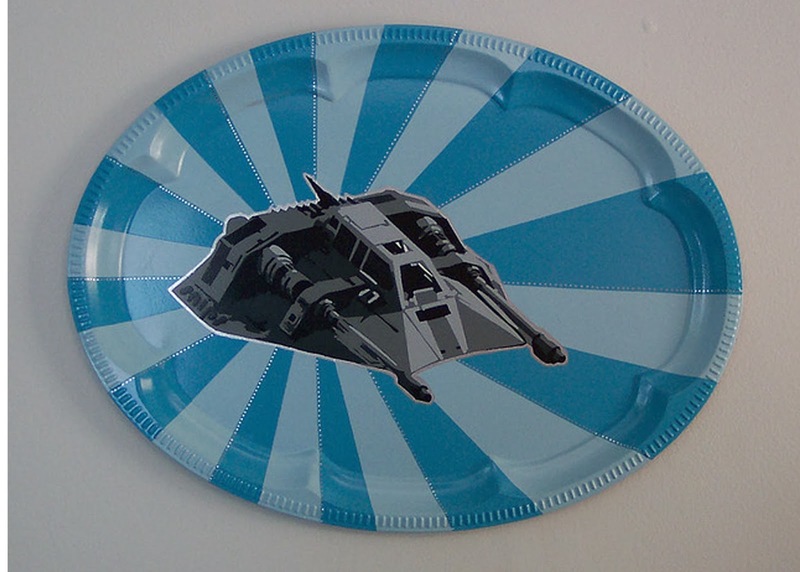 Again, i used Nova's Nesting Bowl Pattern for these and there will be more in my future! 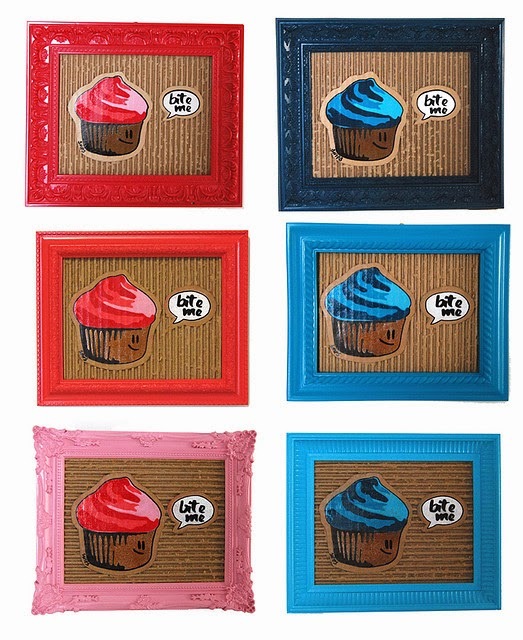 Really people, how cool would these be in a little kids room! don't worry, i only made 6 bowls, i just photoshopped them all together to show them in use! I'll be listing these in my shop this weekend, if you know anybody looking for some storage options! Now for the drum roll please!!!! That's right i'm now the proud owner of four fabulous Dowry pillowcases! These pillow cases were #11 on my FAL list, but i did also have some AMH velveteen to go with them. I had planned on using it for pillow shams but it is currently tacked up in our bedroom window thinking that it may want to be curtains instead! We'll see! Now to get started on the quilt! Well, i guess not quite yet, Sammy's first, then Max's then mine! High fives for awesome pillowcases! Clickity click here for the awesomeness that is Finish it up Friday! And for more awesome click here for NTT! Wip Wednesday - a little bit of this and a little bit of that! For those that know me well enough, you already know that i have issues focusing on one thing at a time. So my day today alternated back and forth from Sammy's birthday quilt and my lovely stack of Dowry. I haven't yet had the time to start in on the quilt, but i did manage to make one of these today! Not my normal fabric pairings, but i was trying to use what i had on hand. And i happened to have some of the Kaffe Fassett Caterpillar Stripe left over from my sister's quilt and the colours match perfectly with the Tangle print from AMH's Dowry line. Throw in a smidgen of AMH's Migratory Lace in Tourmaline and i think we have a win! I only made the one for now because i wasn't sure about the size on my pillows. Turns out it's a good fit and i could even put a slightly larger pillow in if i wanted. So when it's time to get new pillows i'll probably go up a size. (And could we all pretend that my sister's quilt isn't on my bed, i swear i haven't been using it. Though i have been tempted!!) It's still here with me because of this. 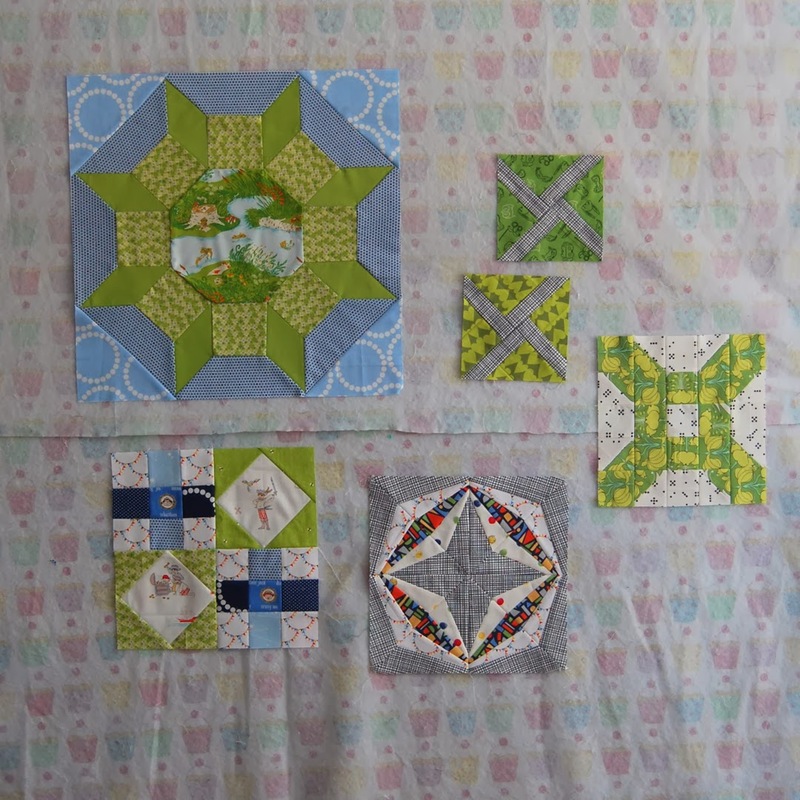 I've now added two whirl blocks, using Rachel from Stitched in Color's tutorial from our Penny Sampler class. A domino block, i though the Domino Dot print would be perfect for this block, and now i want to make a whole domino block quilt using just domino dots! How awesome would that be?! Adding that one to the file of quilts i really want to make! I also tackled Julie's Global Concepts block from her Block Rock'n series, love this one and it was super easy to put together! 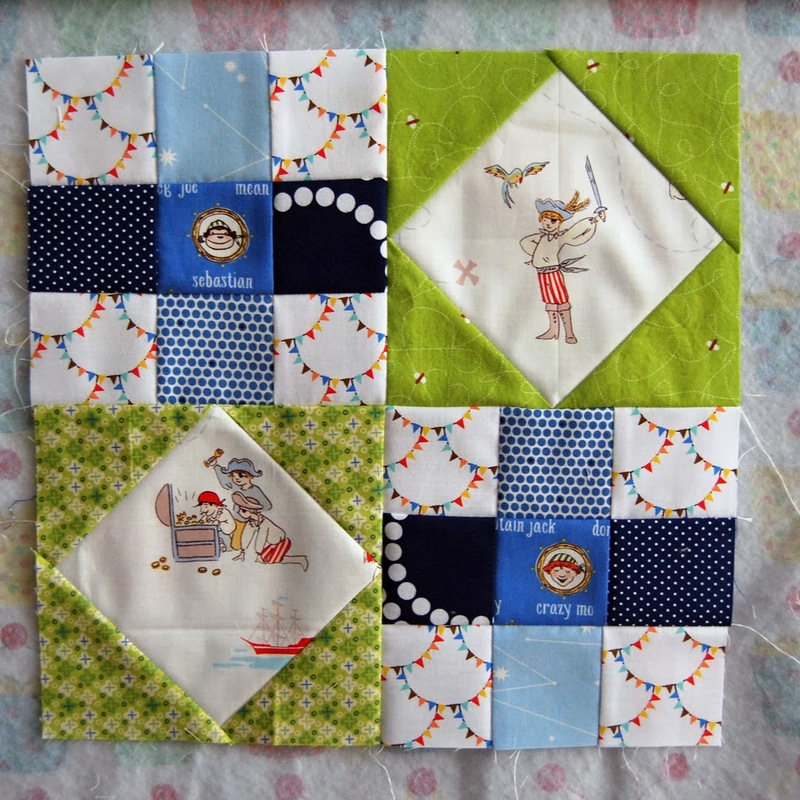 And last i tried my hand at a goose creek block. And here they are all together! So, Sammy's birthday is the beginning of next month. Shall we lay down odds on if i get it done on time?! My original plan had been to make something more along this line, then Sammy requested some stars in it so i moved more in this direction. And i've still yet to make some stars! So next on the agenda is some stars and then i'm just going to free piece it together with strips and scraps! I had wanted to have the top done for the end of the week so we'll see how that goes! But for now i'm going to finish up the rest of my pillowcases! High fives for working down my FAL list! ...and could we all pretend that it wasn't supposed to be finished last year. thanks. So without further ado, lets get to it! I have to say people, it's a good thing i love my big sister as much as i do. Otherwise this one would be living happily on my couch... with me under it! 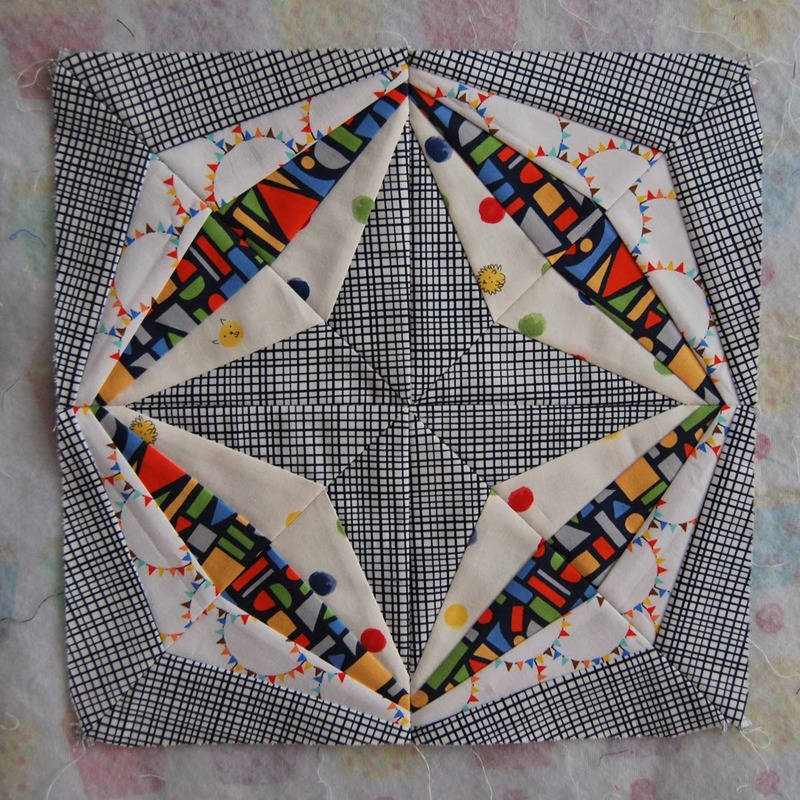 This quilt started with a free paper piecing pattern from Sew What, Sherlock called the Fusion Star. I first used this star for my Christmas stars quilt and fell in love with it. It's a 24 inch block, so one of those ones that gives maxium impact with not a whole lot of effort. Now i'm not saying this was a speedy project, but once i calculated all my fabrics needed and precut everything it did go together quite quickly! Now peeling the paper off the backs, that's another story altogether! In total this quilt took, ahem...153 sheets of paper... eep! (and i had been wondering where all my printer ink went to!) But so worth it! For those of you that have never worked with shot cottons, please, do yourself a favour and use them! So glorious to work with! The colours are just beautiful, and the softness and drape is amazing! This quilt checks a lot of firsts for me. Not only is it my first quilt finish of the year and my first finish on my FAL list. It's also my first time using all solids, a first for using shot cottons, my first entirely paper pieced quilt as well as my first time trying quilt as you go. 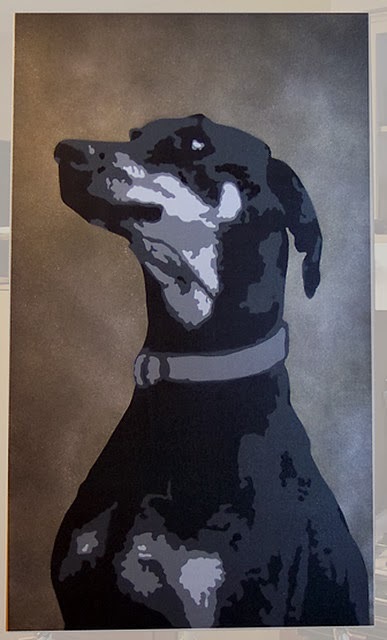 My choice to try QAYG came along after my friend Adrienne posted this tutorial for it. 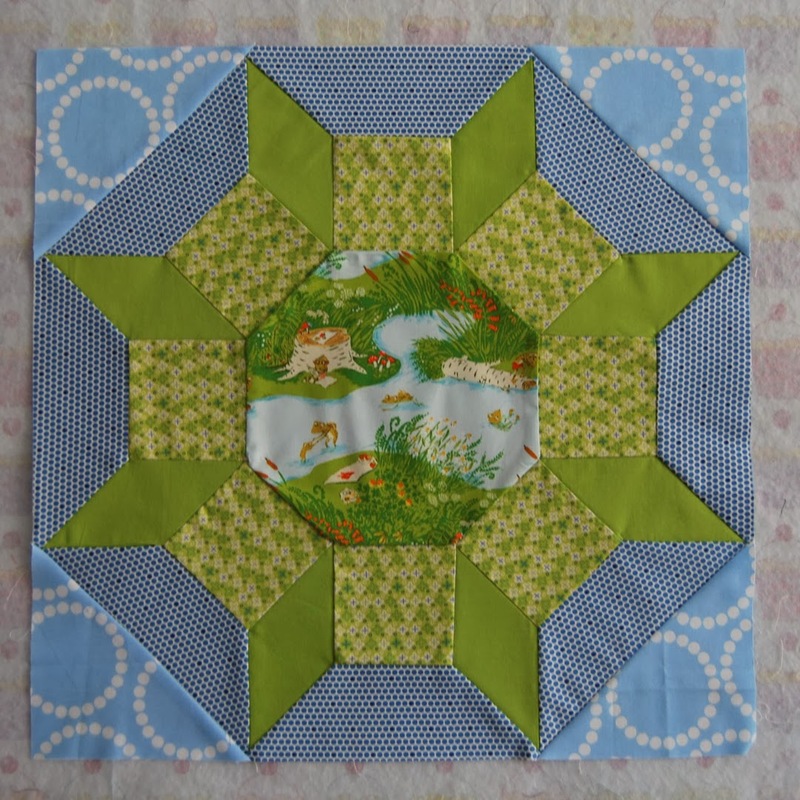 I loved her finished quilt and thought it was a fantastic way to get the quilting i wanted without having to wrangle the whole quilt through my little machine. I knew from the jump that i wanted to echo inside each star and the thought of turning all those corners made me a bit twitchy. 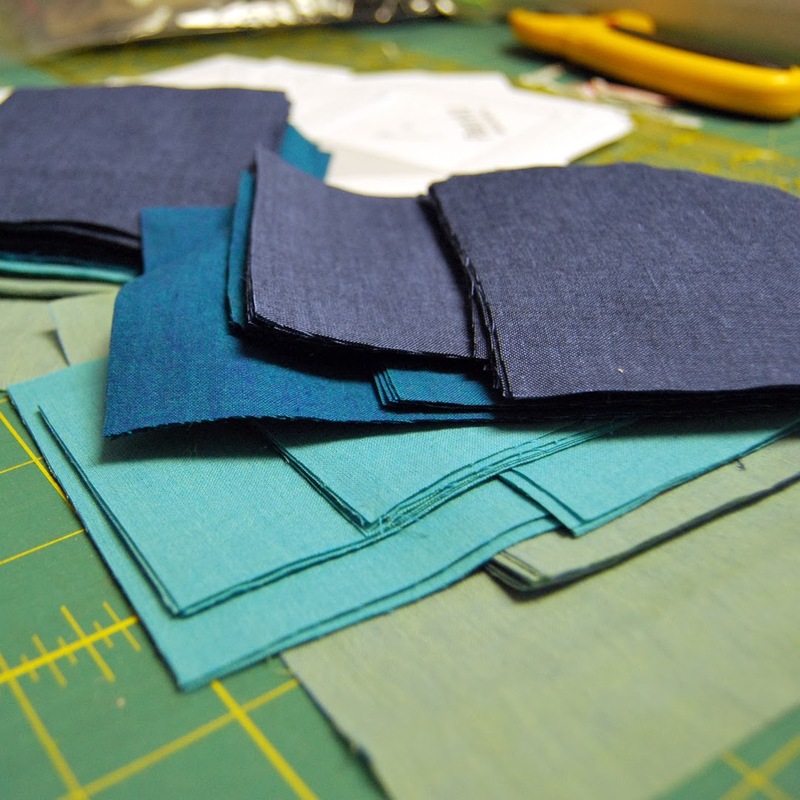 Another bonus to using the QAYG method was that i could use up some of my larger batting scraps. That being said, i'm still on the fence on whether or not i like this method. 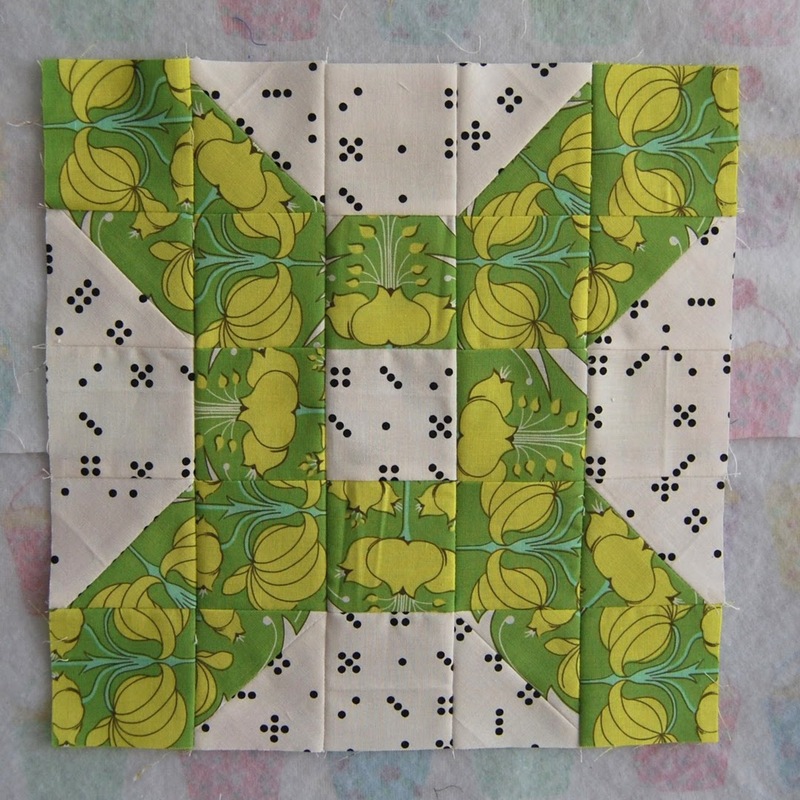 Despite quilting all of the blocks individually, you still need to go back and quilt the backing on. Which kind of messed up the look i was going for the back. Not that it matters, because you can't even see the quilting on the back! 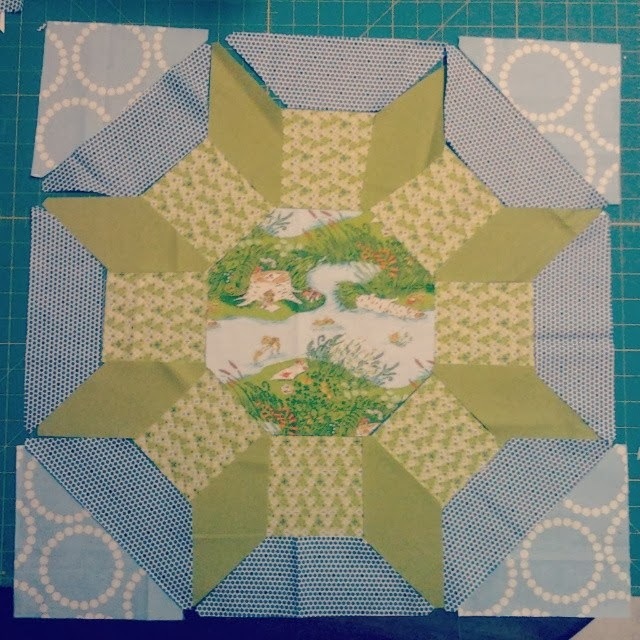 I did a second echo inside the smallest star layer on all then after some much needed help from my IG peeps, the decision was made that i needed to stitch the ditch of all the blocks. I think the minimal quilting helps with the softness of this quilt, but i would like to give it a go with a much more dense quilting and see how that changes things. There will definitely be more shot cotton quilts in my future! All of the shot cottons are Kaffe Fassett and bought from both my LQS as well as Hawthorne Threads. Aqua, Jade, Aegean, and Blue Jeans. And the whole backing is Eucalyptus, with a strip of Caterpillar Stripe in Aqua. My original binding choice was the stripes that i've used on the back, but after seeing the stars altogether i made the decision to use the same blue as the background. I think it lets the stars shine more! Though i did get two little stripes of colour in. I did this in the binding of this quilt and thought i would make it my new trademark, them promptly forgot :) I also reverted back to hand stitching the binding down after not being happy with the last couple of machine stitched bindings i've done. I had forgotten how long it takes me to hand sew a binding! Shout out to my Sammy and my Mom for being such awesome quilt holders, and to my dad too, who came out to help, on crutches no less! Quilted by me on my little old Ken! Getting my link on with Amanda Jean for Finish it up Friday! With Kristy over at Quiet Play for the PPP! And with Kelly for NTT! You know, cause everyone needs to see this quilt! To far? Getting down off my high horse now... But i just love this one so much!! Hello 2014! Are you ready to get stuff done! Like perhaps more blog posts? Seriously people, i'm averaging 1 a month... 1!!! Time to get my crap together and post about it. 2014 shall now be the year to finish it up and blog about it! I've lost track of all the projects i have on the go and i need to finish them, not that i'm saying i won't start anything new, because really people, this is me we're talking about. So again, in a effort to finish things up i'll be joining in the 2014 FAL. This year being hosted by Katy over at The Littlest Thistle. The shot cotton Fusion Star quilt i was making for my big sister for Christmas... it was supposed to fly home with her after the holidays but unfortunately i didn't quite make my deadline. I'm loving this quilt and i really, really want to keep it for myself. If you've never worked with shot cottons before you really must. This is by far the softest quilt i've ever made. I'm using this awesome free pattern from Sew What, Sherlock and i love it! 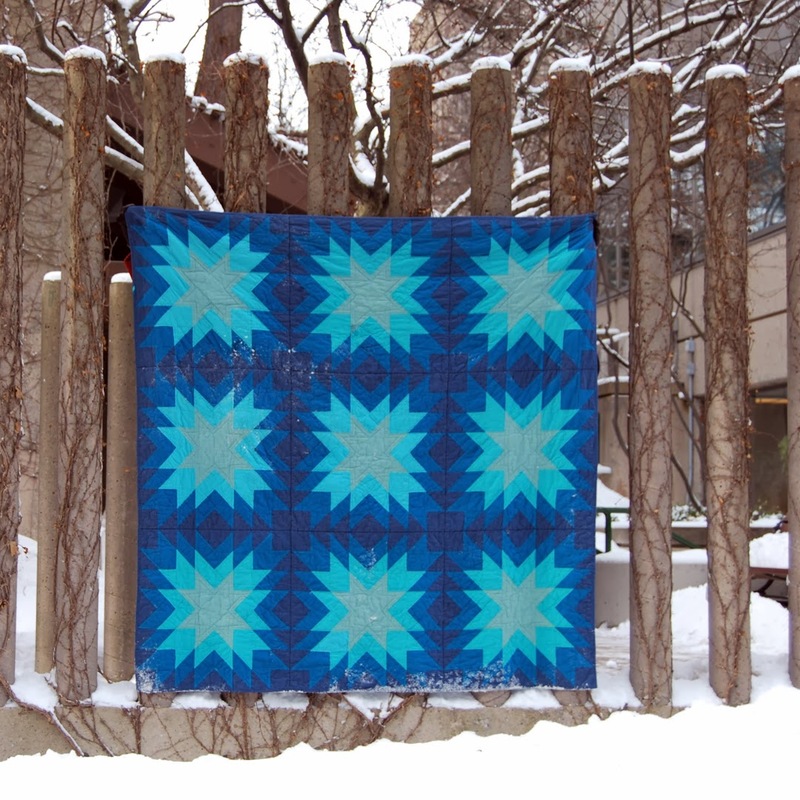 The block finishes at 24", so nine blocks and you have a nice big lap quilt! I've been trying my hand at QAYG and while i can see where it's a fantastic idea,( for example, i'm echoing inside all the star layers and quilting a 24" block is way easier than quilting a 72" quilt), i'm now having to quilt the backing on, so i'm still having to maneuver the whole thing through my machine. Though albeit not as much as if i was quilting the whole thing. So yeah, finish quilting the back on (8 stars left to keep the back on) then bind. This is job number one! Number two is the quilt i'm making for my oldest little guy. I'm attempting to make a quilt for my guys every year for their birthday and both of them were born in February. So first up is Sammy, who's bday is on the fourth. Yikes! I haven't even started this one! I mean i've had the fabrics pulled for about a year now and foolishly thought that there would be plenty of time in January to get it done. I'm going semi improv on this one. Sam has requested some stars in it though so i'll put a smattering of them here and there. I also will be making a couple of other blocks i love. The fabrics pulled with the patterns above are for two fantastic patterns (also free!) from Julie of 627handworks, Global Concepts and Zeppelin. 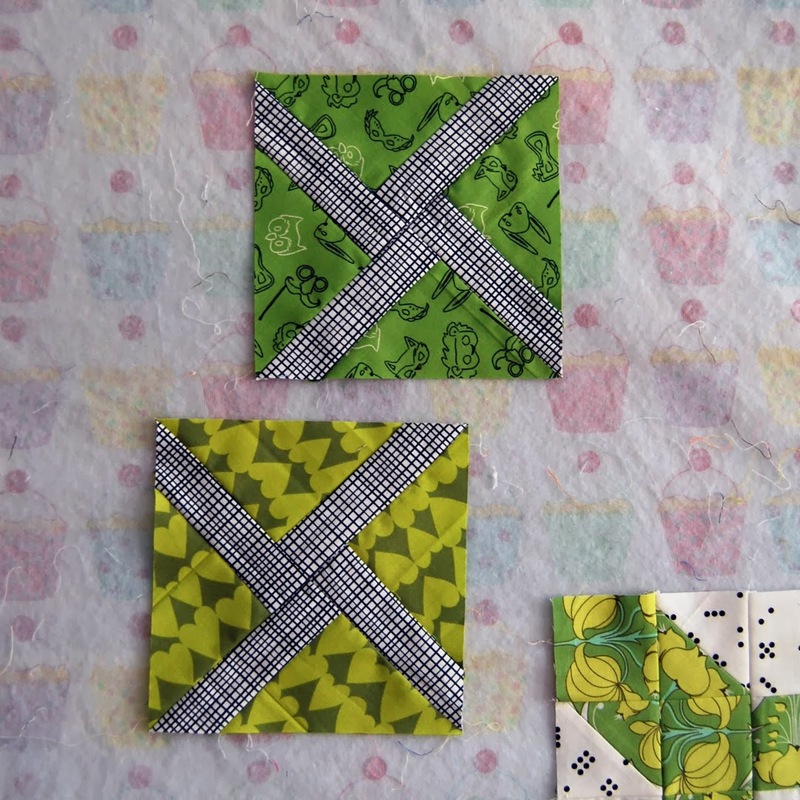 I've also cut fabrics for a castle block using Amy of Badskirt's supersized castles tutorial. Max's Penny Patch quilt for his birthday, which is on the 27 of February. At least this one's all cut out, i just need to sew it together, quilt and bind, no problem. Ha! 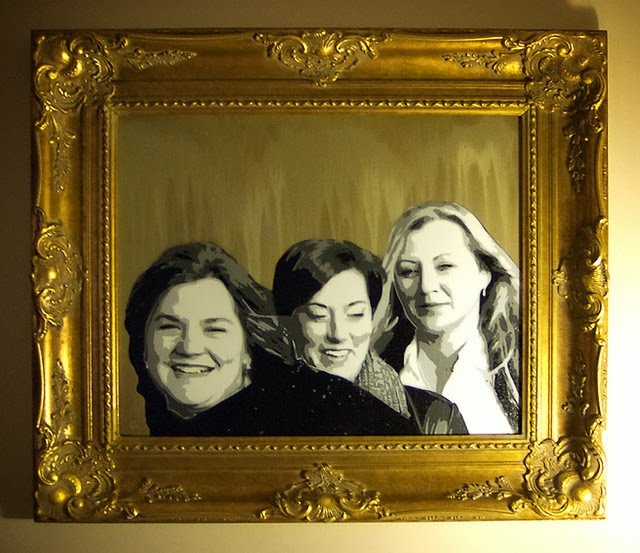 This was also to be a Christmas gift, one for a fantastic friend. Unfortunately it didn't get done in time (story of my life here folks!). So i need to finish it up and get it mailed off. I can't really say more about it, but i hope she loves it! There's no reason for this one not to be finished! 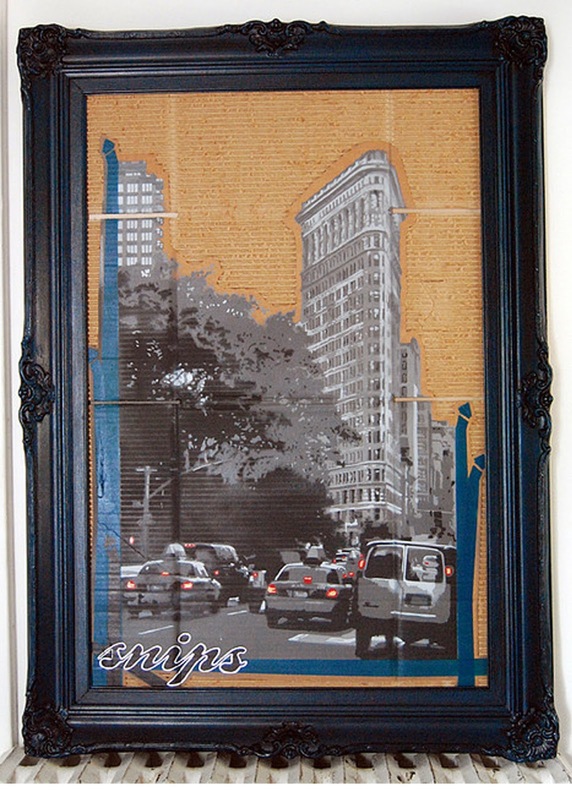 I just have to buy something for the backing (i'm thinking the Carolyn Friedlander widescreens... maybe in yarrow? I'm going to pop into my LQS this week and see if it matches the mustardy colour in the 2wenty Thr3e line. If not i'll probably just go with the grey croasshatch... maybe. Then quilt and bind! 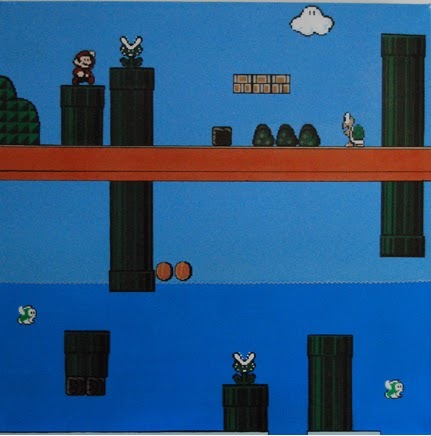 I picked this canvas up from Ikea a while back to make some curtains for the boys room and have quite a bit left over. I want to make a full set of Nova's Nesting Bowls using the canvas for the outsides and a rainbow of Pearl Bracelets for the insides. These are the left over HST's from this quilt, i was thinking about making a cushion or two to put in the shop but i'm thinking instead of using them for more nesting bowls. I've been wanting to try using Nova's pattern for more "fancy" bowls. This could be a great place to start! Please, for the love of all things quilty, just let me finish this dang quilt! I want to be using it while it's still winter! I still have three major blocks to make as well as an entire row of diamonds for the bottom and a handful of smaller blocks to fill the gaps. Then i need to quilt it. 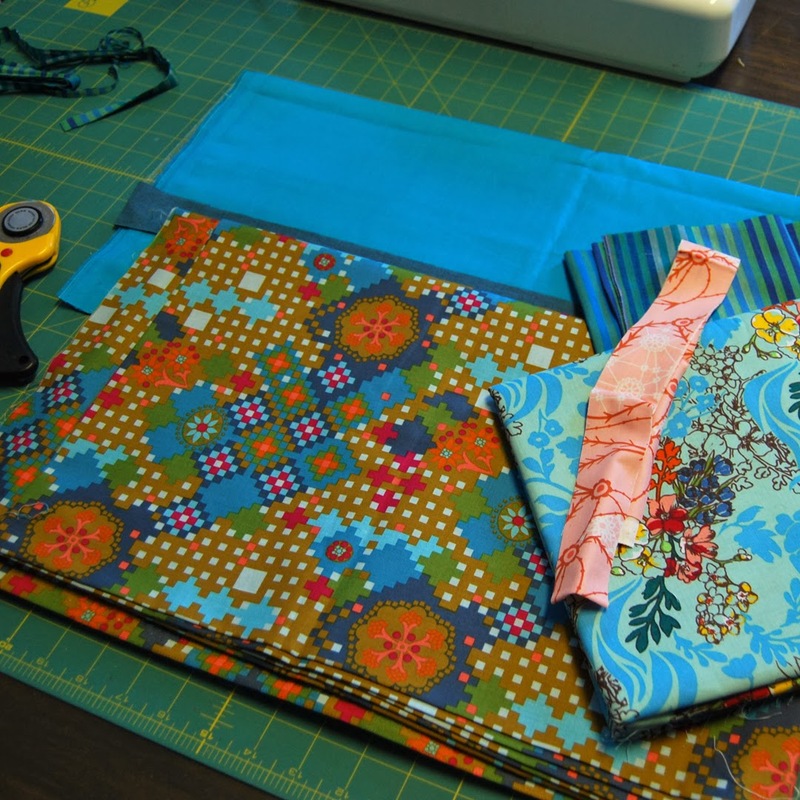 I'll be doing a mix of machine and hand quilting, so really, who am i kidding? This isn't going to get done this quarter, i must be crazy! Again, another project i forgot i was making! I would love to get this one finished. It still hasn't progressed any further than the last time i posted about it. These should happen relatively quickly. I'll be using the AMH velveteen for some pillow shams for our bed and the two AMH Dowry prints (Postage Due in toast and Tangled in aqua) for pillow cases. So then i came across AMH Flight Map pattern. Love! And we know that the fabrics will work for it! I'm hoping to post some more about it soon! And that should keep me busy! Once again people, overly ambitious or just delusional? You be the judge! Linking up over at The Littlest Thistle for the first quarter! There's still time to get your link on, might be the motivation you need to get something done! High fives for a new year, hopefully one that sees me finishing some projects! And did you really think i was going to leave with no pics of my little guys? !